For Chinese women with an awakening awareness for self-development, Bloomberg's recent news that China is considering an end to all birth limits imposed on families might come as a bomb that may shatter their last harbor for independence in reproductive rights. "I've been pushed so much to have a second child that I almost wanted to die after the two-child policy was implemented. Please let me go and don't issue a three-child policy," complained Taoqiyixian, a woman living in Shenzhen, South China's Guangdong Province, on Weibo. Her plea was echoed by many other female netizens, who shared their troubles in dealing with their respective families (mothers-in-law in particular). "I don't want to be a breeding machine," they yelled. The National Health Commission has not yet responded to the speculation of scrapping family planning policy. Even though there is no official confirmation of the rumor, it has aroused fierce discussions online. While a drop of the policy is generally regarded as a progress in society in liberating reproductive rights, it seems that not everyone welcomes it. The news worries many women who believe that, when liberating their rights in deciding how many children they can have, dropping the policy probably will also take something away from them. 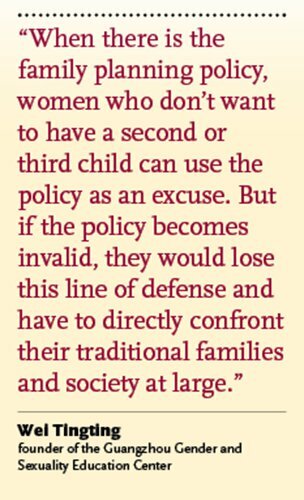 "When there is the family planning policy, women who don't want to have a second or third child can use the policy as an excuse. But if the policy becomes invalid, they would lose this line of defense and have to directly confront their traditional families and society at large," Wei Tingting, founder of the Guangzhou Gender and Sexuality Education Center, told the Global Times. In Chinese traditional views, having more children in a family has always been regarded as the right thing to do. More importantly, given the current unfavorable situation for women in the local job market, the speculation has led many women to worry for their careers. "Under the one-child policy, employers asked female job hunters when they intended on having a child. Under the two-child policy, employers are concerned when they will have a second one. If there is no policy at all, what will they ask and how to answer them?" questioned Ding Kai, a lawyer, on Weibo. China's family planning policy, introduced in the late 1970s, aims to regulate births so as to reduce pressure on limited resources and the environment. A whole generation of modern families has gone through hard times coming to terms with the fact that one family could only have one child. Those who dared to have more than one were at risk of losing their jobs or being severely fined. "From a historic perspective, canceling the decades-old family planning policy would be a progress that endows people more freedom in making choices," said Wei. Interestingly, now Chinese women are not that happy about this possible change. Grace Wang, a mother of a 2-year-old, said she could imagine how people would push her to have more children once birth limits are lifted. "Now they've already started trying to sell me on the idea to follow the two-child policy, which is very annoying," said the 34-year-old teacher at a college in Beijing. Besides her mother-in-law, colleagues, many of whom are well-educated college teachers, have also tried to convince her to have more children. "If I say I will not consider [having a second one], they conclude that I will regret it someday," Wang told the Global Times. "It is funny that anyone can point fingers at me now that having two children is allowed." "It is never easy to be a woman in China. If the [family planning] policy is dropped, you will be pushed to have more children, even if you don't want to, and no one will share your burden," complained netizen Luren, "If you dare to say no, you will drown in their criticism." China's population policy has been adjusted over the years. In early 2016, China lifted its decades-old one-child policy to allow all couples to have two children. "Now [the discussion over abandoning the family planning policy] may suggest that the two-child policy has failed to reach the expected effect and therefore we need more push in this direction," said Wei. "Given this background, young women seem to have felt that, even though the policy could be canceled, it is not to allow them more freedom or rights. Instead, it seems to ask them to shoulder more responsibility," Wei analyzed, explaining that women have a reason to feel worried. Many fear that once the family planning policy becomes invalid, they will lose a solid excuse to not have more children and, without that buffer, they will have to face increasing pressure from society to have more children. Zhu Mei (pseudonym), a mother of a 4-year-old in Beijing, said it depends on to what extent a woman could stay independent rather than be influenced by society. She said her mother-in-law began to push her to have a second child even before the two-child policy was announced. But Zhu said she will not consider it given her health condition and her economic situation. "Now I'm already on the brink of collapsing, barely keeping a job. If I have a second one or more, I'm sure I will be doomed. I will probably have to quit to become a full-time housewife, which is the last thing I will choose," said Zhu. "You have to fight for the initiative yourself, which first demands you to have a job," Zhu added, "But if you have two or three children and become a full-time mom, how could you keep independent?" Zhu told the Global Times that once the family planning policy ends, it will inevitably weaken all women's competitiveness in China's job market. As an HR representative herself, Zhu revealed that women who are married without children are at a disadvantage when it comes to finding a job. In finding work, female job hunters are usually asked questions such as "When will you get married?" and "When will you plan to have a child (or a second)?" after the two-child policy ends. Those who are married with two children are reportedly more competitive than newly married women, since the former can save the company time and money by not going on paid maternity leave, along with other workplace troubles related to pregnancy and breastfeeding. Once the family planning policy ends, many women, including those who already have one child or two, worry that they will be regarded as mothers-to-be by potential employers. In one extreme case, a netizen named Liuyeanan wrote that a woman of childbearing age showed a certificate verifying that her tubes have been tied (to prevent pregnancy) just to convince interviewers that she wouldn't get pregnant. "So do I need to prove that I'm a celibatarian, or a DINK (double income, no kids), or a lesbian, to get the job?" another netizen joked. "While giving people more freedom, such a policy no doubt will also result in women being affected by traditional culture and inequalities between men and women," said Wei. As a result, many Chinese women now see the positive side of the former one-child policy that they once resented. Alice, a 30-year-old only child from a well-off family in Beijing, said that she is grateful to the old family planning policy, in that she is the sole heiress of her family's fortune, which previous generations of women of her family never had the chance to enjoy. "Since I'm the only child, I have the chance to study abroad and enjoy resources provided by my family," said Alice, "But if I had a brother, I could not go abroad and would not be eligible to inherit the family property." Alice's view was echoed by many other only-children women, saying that the one-child policy allowed a generation of Chinese females to be raised equally alongside males, which never happened before in Chinese history. Some also say that the old family planning policy allowed a large number of women to be liberated from childbearing at an early age so as to develop themselves in their educations and professions and thereby gain independence. But such views are widely criticized by other women who stress how women's rights - and their bodies - were violated in carrying out the policy. Such bipolar ideas to some extent reveal the anxiety of Chinese women in the country's ever-changing society. Stressing that canceling the family planning policy is a step forward, Wei calls for matching policies to guarantee women's rights in marriage and job markets to make them feel more secure and under less pressure. "In some countries that encourage childbirth, there are proper subsidies, vacations and policies to guarantee that women will not be discriminated against after childbirth. It is a systematic problem to be solved," said Wei. "Currently, there is already discrimination against women in the job market. And it grows increasingly difficult for women to get property from marriage. Then who could guarantee her life if a woman quits her job for childbirth but without any income?" added Wei. She holds that, without proper supporting policies, birth-encouragement policies might not have much effect in China, as more young people are independent in mind and spirit and no longer see having children as any kind of benefit.